One of the finest heritage hotels in Jaipur, Diggi Palace Hotel is located 12 km from the nearest airport, and just 1.5 km from the closest railway station as well as from the bus stand. 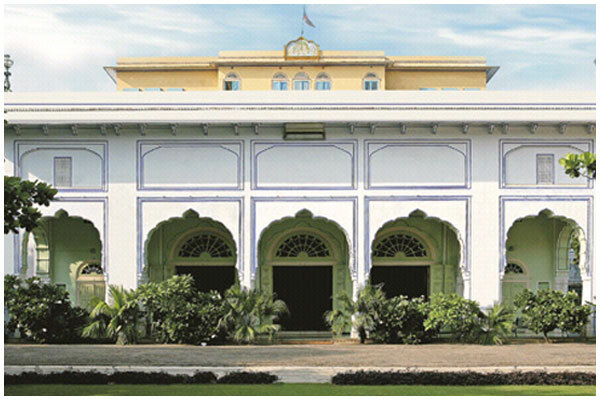 Set amidst 18 acres of a cluster of havelis, structures and gardens in the heart of Jaipur city, the hotel was built by Thakur Sahib Pratap Singh in the year 1881 AD. Gorge upon a range of Continental and traditional Rajasthani delicacies at the exquisite restaurant at Diggi Palace Hotel in Jaipur. Situated in a Baradari, the restaurant offers a captivating rooftop view of the scenic background. Diggi Palace Hotel helps you meet your business requirements as well as hold big reception parties. For conferences and meetings, the main Durbar Hall with its own private garden is an ideal venue. Buttressed with modern amenities, this hall is decked with colorful frescoes, and can accommodate 300-500 people. For huge gatherings of 1000-1500 guests, and gala dinners with various themes, there is a spacious lawn. The Pink City of India, Jaipur is a beautiful city in the North Indian state of Rajasthan. Renowned for its blue pottery, hand block print, embroidery, jewelry, and enamel work, Jaipur promises an amazing shopping experience at its popular shopping center. Situated 260 km away from Delhi, Jaipur is dotted with golden sands, imposing forts, and quaint palaces, mansions and gardens.